The Colorado Avalanche has signed defenseman Sergei Boikov to a three-year, entry-level contract. Boikov completed his third campaign with the Drummondville Voltigeurs in the Quebec Major Junior Hockey League in 2015-16, where he recorded 26 points (six goals and 201 assists), 73 penalty minutes and ended with an even plus/minus rating in 52 regular-season games. He also finished with 13 points (three goals and 10 assists) on the power play. In the 2016 QMJHL playoffs, the 6-foot-2, 195-pound rear guard had six penalty minutes and a minus-3 rating as Drummondville was outscored 33-4 in a four-game, first-round sweep by the eventual league champion Rouyn-Noranda Huskies. Colorado selected Boikov 161st overall in the sixth round of the 2015 NHL Draft, and the young D-man joined the Avalanche's American Hockey League affiliate, the San Antonio Rampage, following the conclusion of his junior season this past year as an amateur tryout. The 20-year-old made his professional hockey debut on April 8 against Iowa and went on to appear in four contests with the Rampage, finishing with two shots and a minus-2 rating. The Khabarovsk, Russia, native came over to North America after he was picked No. 90 overall by Drummondville in the second round of the 2013 Canadian Hockey League Import Draft. 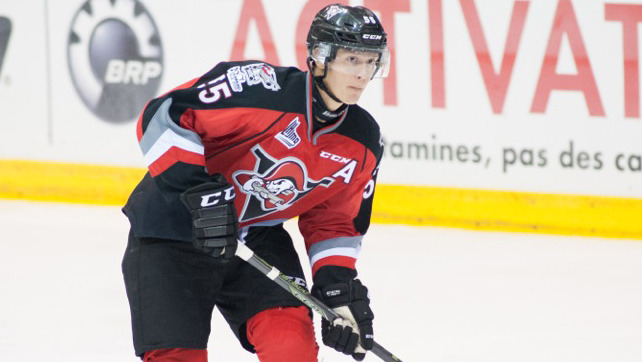 Boikov joined the Voltigeurs for the 2013-14 QMJHL campaign and finished his rookie season with 12 points (two goals and 10 assists) in 68 games. He nearly doubled his scoring total the following year, registering 21 points (three goals and 18 assists) in 64 contests in 2014-15. Prior to his time with Drummondville, the blueliner played three games with Kuznetskie Medvedi in the Russian junior league. Boikov won a silver medal with Team Russia at the 2016 IIHF World Junior Championship in Helsinki, Finland, playing in all seven of his nation's games and finishing with an even plus/minus rating and six penalty minutes. He also represented Russia at the 2013 Ivan Hlinka Memorial Tournament and was on the country's select team for the 2015 Canada-Russia Super Series against all-star squads of the QMJHL, Ontario Hockey League and Western Hockey League.